I chose the cream cover with the printed pattern and was very pleased with my choice once I had it in my hands. 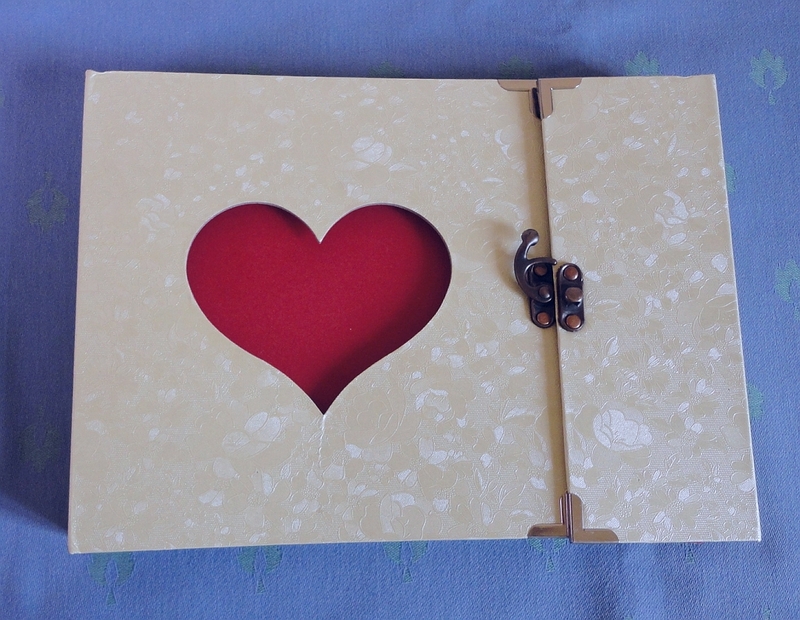 In person, the photo album is really pretty and the antiqued metal closure gives it an old-fashioned charm. It works now, but it is cleverly designed to close flat when the pages have been filled and the thickness is increased. 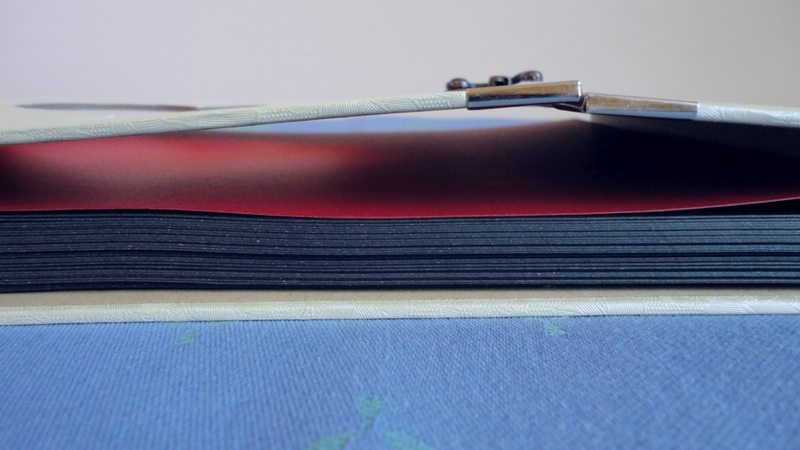 The album comes complete with 30 pages of black medium-weight carton. The page size is 24.5 x 18 cm (A5), and ideally the largest photo that would fit is the common 6 x 8 format. 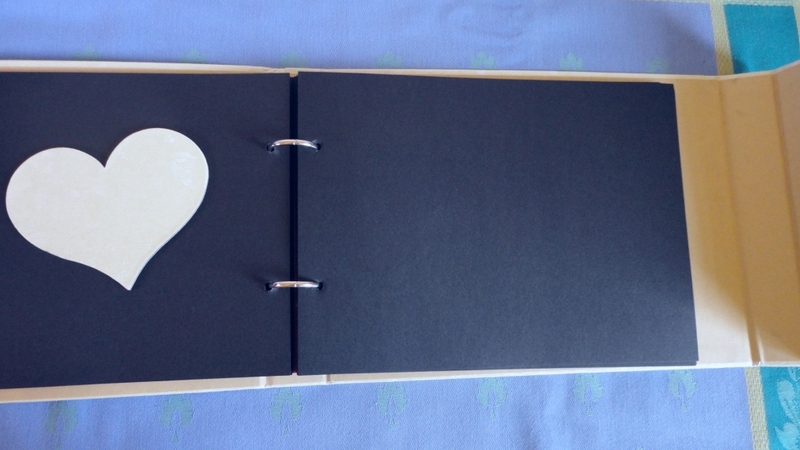 The metal ring binding allows you to open the album and remove any given page, and also add more if you so wish. 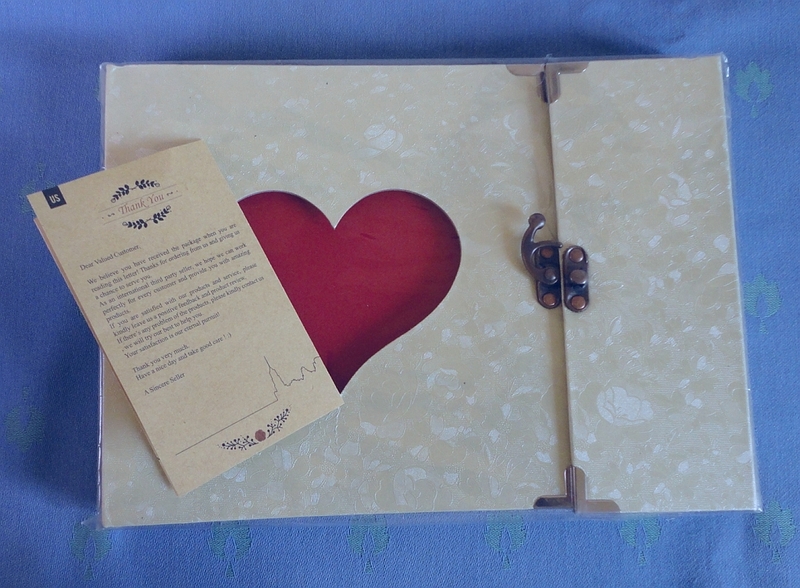 The heart cut-out shape is a very pretty idea. Before giving this to my husband, I attached a favourite photo on the inside of the front cover, which now shows through the heart. This small detail can be updated and personalized very easily. 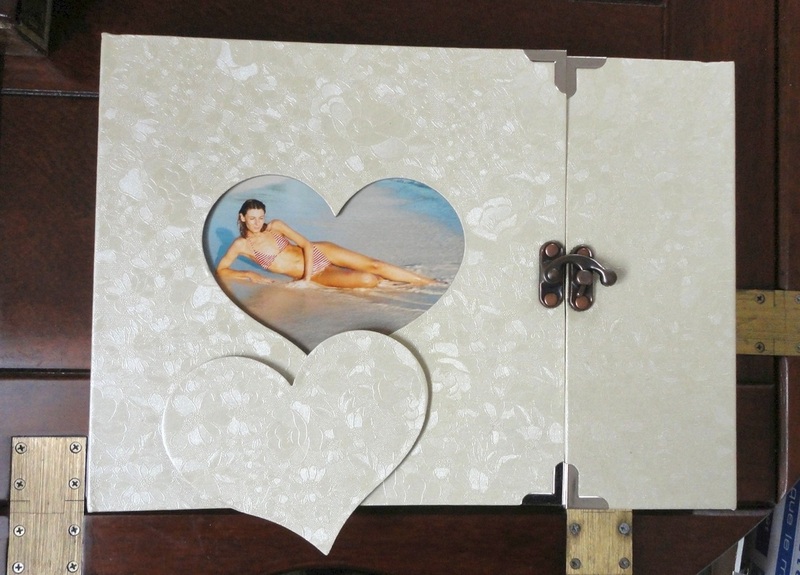 We already have many large photo albums and they can become heavy and unwieldy. In this digital age, the vast majority of our photos, new and old scanned ones, are stored on a hard drive, but this relatively small folder makes an ideal repository for very best photos, the all-time favourites. The visual and tactile appeal of an album of printed photos is very similar to that of a real book, so easy to pick up and glance through. We still enjoy handling books and photos, turning the pages and remembering happy occasions and cherished moments. For me, that's what this album is all about, and why I like it so much. This charming small object would make a thoughtful gift for a loved one, especially if you start off the collection with a couple of pictures that you know will be appreciated by the recipient, or fill it with photos of a special and meaningful day. I was given this little compact as a gift a couple of years ago and I finally got around to writing a review as my friend bought a newer model (W530, I think) and had some issues with it that I never had. I'm starting to think that perhaps I got the better camera, albeit an older model. 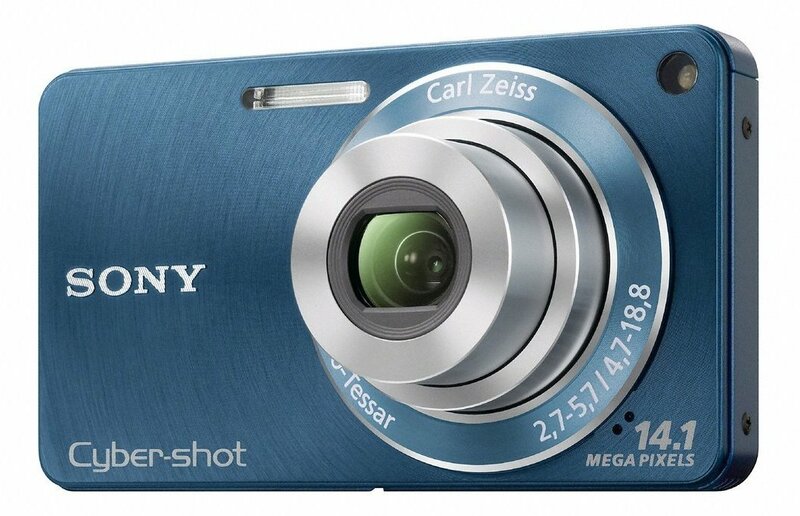 My previous camera was also a Sony and I was happy to have a Carl Zeiss lens again. My usual subjects are landscapes, animals (mostly my cats and horse) and my garden. I love the ease of use of the Cybershot. When I first got it, I read the whole manual but, in truth, I rarely have to use any advanced settings. Perhaps, I am expecting too much from a compact, however, I still think a lens this good should not distort faces and a little more zoom would have been useful. 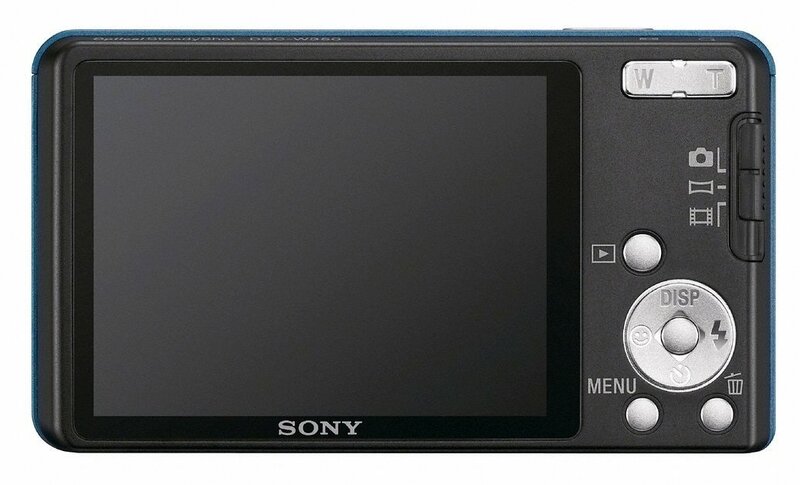 However, it is a great little camera and, it appears, more solid than the latest models. Just for the record, most of the photos on this site taken by me (i.e. not official product pictures) were taken with this Cybershot.